Boost your productivity with a quality used Ram truck or cargo van from Evans Arena Chrysler Dodge Jeep Ram! Our used Ram truck dealership in Dayton, Ohio, has the working vehicles you want, from a Ram 1500 light-duty crew cab, to a powerhouse Ram 2500, to the massively capable Ram 3500. 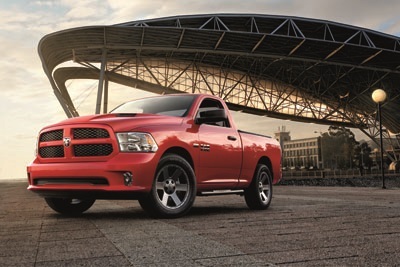 The unique suspension of a Ram truck makes for a smooth ride on the job site and on date night. In the market for a versatile cargo van? Use our online CarFinder tool let us know what you're after, and we'll locate the perfect Ram ProMaster for you! Find a used Ram model at your local Dayton, OH Ram dealership. Evans Arena Chrysler Dodge Jeep Ram has a tremendous selection of used Ram trucks and certified pre-owned vehicles to meet the needs of every driver and their budget. Save big on already attractive pricing with used vehicle specials and featured used vehicles. Our Dayton, Ohio, dealership is here for you for the long haul with certified service and genuine Mopar parts and accessories. Evans Arena Chrysler Dodge Jeep Ram offers extraordinary deals on pre-owned vehicles, plus exceptional savings on new cars through manufacturer incentives and competitive loan rates. Value your trade online, then fill out our secure finance application to get pre-approved for a new or used Ram truck in Dayton, OH.